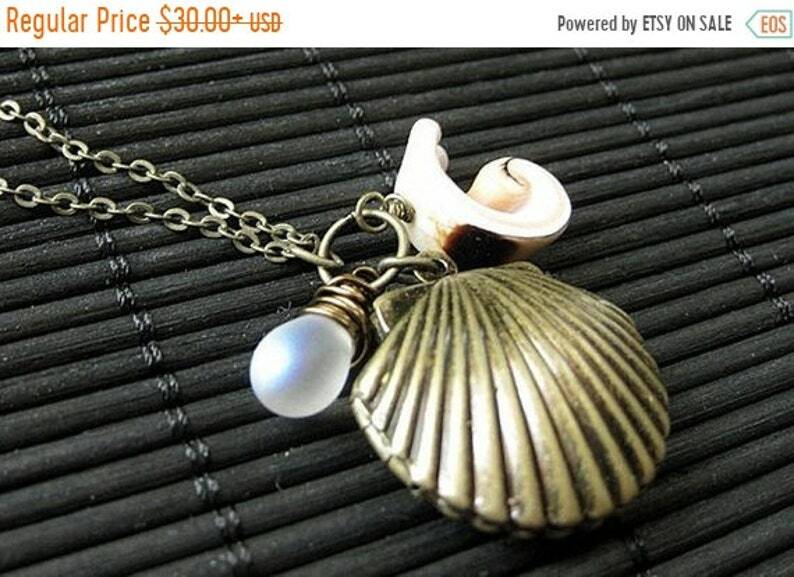 EASTER SALE Seashell Locket Charm Necklace in Bronze with Wire Wrapped Frosted Teardrop. Handmade Jewelry. Seashell Locket Charm Necklace in Bronze with Wire Wrapped Frosted Teardrop. This "Day at the Beach" handmade necklace is created with a little bronze seashell locket accompanied by a seashell swirl and a wire wrapped frosted glass teardrop . Necklace comes with a matching bronze chain. EASTER SALE Rainy Day Umbrella Necklace in Bronze with Wire Wrapped Blue Teardrop. Handmade Jewelry. EASTER SALE Happy Necklace with Yellow Teardrop. Charm Necklace in Bronze. Handmade Jewelry. Bronze Earrings. Glass Teardrop Earrings. Dangle Earrings. Wire Wrapped Earrings. Drop Earrings. Elixir Earrings. Handmade Jewelry. Gold Earrings. Glass Teardrop Earrings in Gold. Dangle Earrings. Drop Earrings. Wire Wrapped Earrings. Elixir Earrings. Handmade Jewelry. Metallic Seashell Earrings. Clam Shell Earrings. Bronze Post Earrings. Beach Earrings. Sea Shell Earrings. Stud Earrings. Handmade Jewelry. EASTER SALE White Rabbit Charm Necklace in Bronze with Wire Wrapped Teardrop and Genuine Pearl. Handmade Jewelry. EASTER SALE Bumble Bee Necklace. Scrabble Tile Necklace. Bumblebee Charm Necklace with Amber Teardrop. Handmade Jewelry.